This small jazz venue located in the middle of Vedado is owned by one of Cuban jazz giants, Lázaro Valdés. This privately owned bar offers drinks and live music every night. It attracts a slightly older crowd, mainly locals, as well as the odd tourists. Everything is sleekly decorated in white, with blue and purple lighting setting the mood. A dome rises over the stage to improve the acoustics. 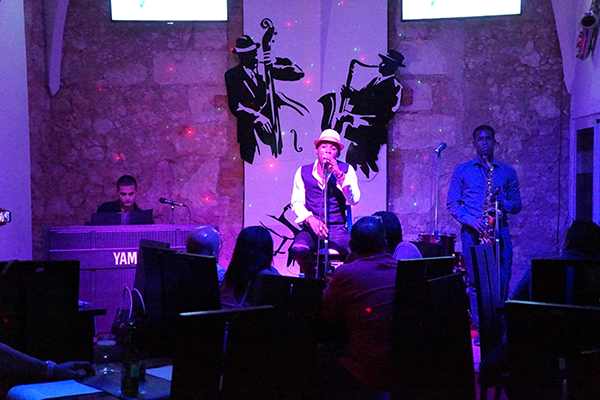 Normally the live music includes renowned local musicians from Havana’s jazz and salsa scenes, but the night of our last visit featured a new band made up by a singer, a keyboard player and saxophonist. The repertoire was all smooth jazz ballads that killed a bit of the vibe of the place to be honest, but it was also fun and unique. One drawback for all cigar smokers is that it is non-smoking; it has a smoking patio with chairs but no smoking is allowed where the live music is. Address: Calle E No. 105, entre 5ta y Calzada, Vedado, Plaza de la Revolución, La Habana.